When I first heard my company sales meeting would be held in Las Vegas, I admit I was elated. Normally, our meetings are held in the quiet town of Logan, UT which is as different from Las Vegas in just about every possible way. While Logan is a nice place to live, isn't all that exciting to visit. Spending a couple days in the fantasy land of Vegas with all the bright lights, over the top attractions, and its "Can you top this?" attitude is undeniably a lot more fun. Of course, pretty much everything in Vegas is fueled from somewhere else. For starters, there's no way the surrounding desert can provide all the energy and water needed for the bright lights and pretty landscapes all over town. All those resources have to be brought from somewhere. Even if you're not bothered by the environmental unsustainability of the place, you have to admit the Las Vegas strip consists largely of attractions manufactured to look like someplace else. Not only are large cities like Paris, Monte Carlo and New York recreated in Vegas, the city attempts to import entire countries like Italy and Egypt into its mix. The drive of the few entertainment corporations dominating the city to capture more and more tourist dollars has transformed the city of Las Vegas into its own world, a manufactured city of anywhere. As for beer, it's mainly used in Vegas as a device to cheaply deliver alcohol to tourists so they don't realize how much money they're losing at the slot machines. The pace is full of flashing signs entice people to come in off street and into the casino with the promise of $1 PBR's or Bud's. In this seemingly hostile environment to local, high quality beer, I walked into the city one Sunday night seeing what local beer I could find. I first stopped at The Pub at Monte Carlo, one of those places boosting of about a hundred taps, fitting in with the "bigger is better" ethos of Las Vegas. The place offered a local tasting flight, so I went with that with my dinner of fish and chips. First up were three samples from Sin City Brewing. Their Weisse and Amber were OK, rather unoffensive beers on the lighter side. Definitely thirst quenching on a hot day, but I suspect dialed down a bit to be popular for tourists looking for something slightly more than $1 PBR's. I actually liked the Sin City Stout with its nice chocolate notes. Sin City Brewing turns out to be another manufactured Las Vegas import. It was founded by a former Gordon Biersch executive and is brewed under contract at Gordon Biersch's Brewery in San Jose. Ironically, my quest in finding local beer in Las Vegas turned out to be beer brewed about ten miles from where I live. Next up was a couple selections from Las Vegas's Tenaya Creek Brewing. The Hefeweizen was light, with a sour tang and some fruity esters struggling to get out. But lord, what happened with their Hop Ride IPA? All I got was a lot of unsatisfying tea-like bitterness and a bunch of phenolic off-flavors, all leaving a bad coating in my mouth. I hate to judge a beer so harshly on just a sampler glass, but it was easily one of the least enjoyable IPA's I've ever tasted. Finally, I tried Big Dog Brewing's Red Hydrant Ale, which has won a couple World Beer Cup medals in the English style-Brown category over the last couple yeas. And indeed, it was a nice beer. If I ever get the chance, I would like to try other beers from this brewery. Once that was finished, it was time to head back through the Las Vegas strip back to my hotel. On the way back, I noticed the Ellis Island Casino and Brewery. Nothing from the outside suggested New York's Ellis Island. Intrigued, I decided to venture in. The casino was basically a large room filled with a bunch of clanging slot machines, with a bar in the middle, a lounge to my far left, a pizza place to my right, and a barbecue restaurant in the back. Up in front was the brewery, with large windows helpfully allowing everyone to see the shiny brewing equipment. I took a seat at the bar and everyone has me pegged as some guy from out of town in about 15 seconds. The bartenders literally addressed every single person by their first name except for me. Unquestionably, this was a locals' hang-out off the strip. "Try the amber," suggested the thin, gaunt man to my left working on a bunch of Jumble word puzzles clipped from some newspaper. Two old guys on my other side were in getting their growlers refilled, which I immediately suspected they emptied each night. "The amber is the best, not too hoppy like the IPA. Just right. And it's fresh" one of them advised, pointing to the brewery. "How long has this brewery been here?" I inquired. "Oh, maybe 15 or 20 years," he responded as his growler will filled. So I ordered the amber. The bartender puts down a tall glass on the counter and I ask him how much, expecting to pay five or six dollars. "Two bucks." I suppose they need to compete on price with all the $1 PBR's and Bud's. character and a slight earthy finish. But to deconstruct this beer into flavor components is missing the point. This beer had actual authenticity. It was not brewed for the tourists, but for the people who actually lived here. Finishing the Amber, I tried the IPA next. It wasn't anything like the big West Coast IPA's I'm used to, which was a good thing. It had this light, clean bitterness with a just a whisper of citrus, the perfect beer for whiling away a hot afternoon at the quarter slot machines. Unlike most things in Vegas, this brewery was something that couldn't be manufactured. For a city of where real authenticity hardly exists, it was a comfortable to find. Next time I'm in Vegas, you'll know where to find me. In the movie "Field of Dreams" the big question was who would come to an empty baseball field. At yesterday's Bacon and Beer Classic held at San Jose's Municipal Stadium, there were no such questions. Take an empty baseball field, and then add plenty of beer and bacon-inspired dishes from local restaurants and lots of people will show up. While there were plenty of great bacon dishes, my favorite one from the evening were the bacon tacos from California Café of Los Gatos. Made with candied bacon, Meyer lemon crème fresh, cherry stout barbecue sauce, and chile arbol slaw, these deceptively simple looking tacos where simply a flavor explosion of hot, sweet, savory and smoky. They were only slightly better than the pork belly and chorizo "lollipops" California Café was also serving up. 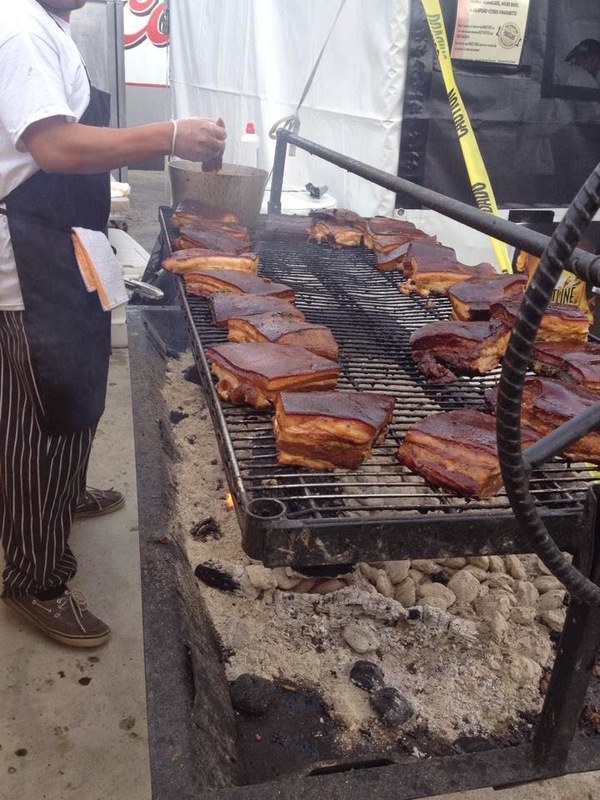 Other notable dishes included smoked pork belly and biscuits served up by Faultline Brewery Company and a creamy, smoky bacon guacamole from San Jose's Loteria Taco Bar. It also helped this guacamole was about the only vegetable at the entire festival. As for beer, the South Bay was well represented by Faultline, Strike Brewing, Gordon Biersch and Santa Clara Valley Brewing. But actually, two of the more interesting beverages I tried that evening weren't beers. Auburn's Common Cider poured a Lemon Saison Cider, brewed with Saison yeast with a little lemon. With only a hint of sweetness, the mix of lemon, apple and light yeast flavor is quite refreshing, yet with some depth and sophistication. And then there was San Francisco's T. W. Pitchers' Snake Bite, a blend of lager and cider that's been traditionally mixed in British pubs. I found T.W. Pitchers' version worked well, with some sweetness in the cider in the forefront with the hops from the lager kicking in at the end giving a little extra to this light, thirst quenching beverage. Finally, for desert there was plenty of choose from. Campbell's Kindred Cooks passed out some addictive bacon caramels. San Jose's Sweet Tooth Confections served up luscious cupcakes. A Chocolate Bacon cupcake and a Stout-flavored Black and Tan cupcake with bacon bits sprinkled on top. And Psycho Donuts was there with their popular Squeal Meal donuts, a one-two punch of donuts sprinkled with bacon. One of the most enjoyable and unique beer festivals I've ever attended and a heart-stopping evening in more ways than one. I'll leave you with some pictures from that evening. Lately, I've run into a some beers that aren't quite what they seem, at least from a style perspective, with each brewer giving the beer a little extra oomph to push it over its stylistic edge. Sometimes that's a good thing, sometimes that's a bad thing. First example is Beer Republic's Grand Am Pale Ale. This really could pass for an IPA, with all its classic piney, grapefruity hop character supported by a solid, crisp malt backbone. It's a very hop forward pale ale, out of balance in a good way. It's hoppy, yet refreshing and works as a lawn mower beer, a really difficult line to walk. Really great beer. Less successful in my opinion is Anchor Brewing's Saison. Anchor's Brewmaster Mark Carpenter really goes for it adding lemon peel, lemongrass and ginger into the mix. It's lemony and spicey, but a little ends up going a long way and it ends up coming across as an over spiced lemon pepper bomb. Not a bad beer, but I thought it didn't quite work. Finally, there's Sierra Nevada's Beer Camp Hoppy Lager for Sierra Nevada's fun Beer Camp series. As far as truth in advertising goes, it's only half accurate. It certainly is hoppy, but in no way resembles a lager. It's a good beer, with a clean hoppy bitterness with some light floral notes but with an almost creamy malty character rarely found in any lager. I mean, I really liked it, but a light, crisp lager with a little bite is a thing of beauty if you ask me, and this isn't that. My guess is most people won't care. Every so often after discovering a few new beers I like, I want to tell the world about them. Or at least the small part of the world that reads this blog. So let's get right to three beers to check out if you get the chance. OK, that's nice, but how does it taste. Like all Gordon Biersch beers, it's not a flavor explosion but a beer meant to be appreciated. It's got a little yeastiness, with noticeable fruity esters and apricot flavors. There's light toastiness from malt, and at 7.3% abv the alcohol is slightly noticeable, but not in a bad way bad way. A great sipper for a lazy afternoon and yet another example of Gordon Biersch brewing precision. Next is Ninkasi Brewing's Dawn of the Red India-Style Red Ale. I knew this was going to be good as soon as I poured it into the glass and all those great hop aromas started wafting upwards towards my nose. It's bursting with very tropical, pineapple hop flavors and the slightly sweet roasted malt gives it both a juiciness, and flavor profile of a caramelized pineapple. Personally, I find Ninkasi beers to be a hit or miss proposition given their rather aggressive use of bold flavors. Sometimes, I wish they would dial things back a bit or other times I find their big flavors all clashing with each other. Here, they've really nailed it. Finally, there's Strike Brewing Big Wall Imperial Stout, their winter seasonal. I enjoyed it so much at their tap room, I made sure to take a 22 ounce bottle home. Thankfully, Strike avoids the cloyingly sweet "liquid brownie" direction too many brewers take with Imperial Stouts. 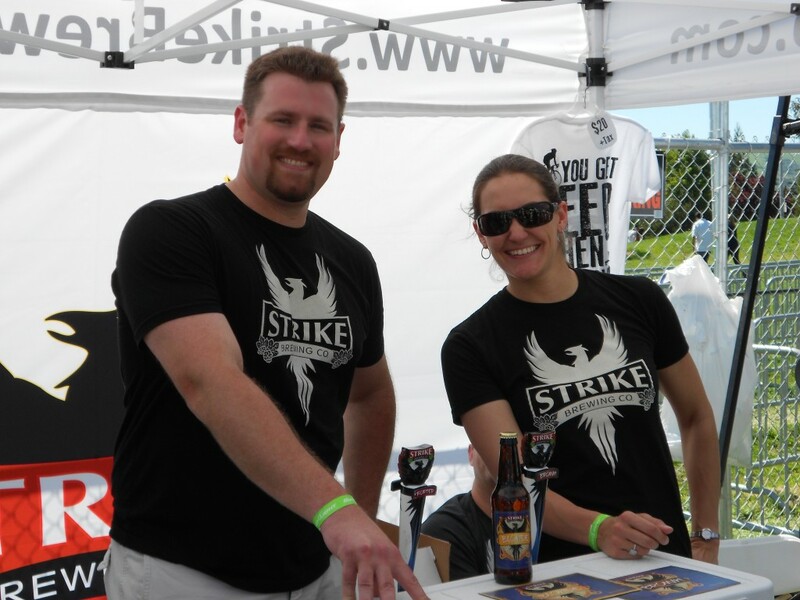 Strike's version is very rich, very dry, with plenty of depth, lots of coffee flavors, with a very sturdy malt base. It's very smooth with no noticeable alcohol present despite checking in at 9% abv. Given that Strike's usually goes for sessionable, drinkable direction in their beers, it says a lot about Strike that when they go for it in an Imperial Stout, they brew one of the best ones out there.